The second day of the teachers' strike in Chicago has made national headlines, bringing attention to the tensions between public schools and the federal government, unions and administrators, teachers and their bosses. 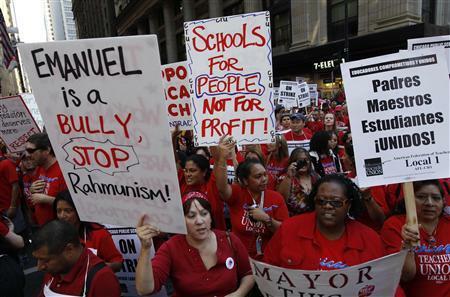 About 26,000 members of the Chicago Teachers Union walked out Monday, locking more than 350,000 students out of schools and contract negotiations continue, according to a report by USA Today. At issue is whether the use of standardized test scores can be used to evaluate teachers, the spread of charter schools that hire non-union teachers, and the loss of teachers' job security. It's something that can be traced to the No Child Left Behind Act under the President George W. Bush Administration, which required states to test students to qualify for federal funds, and continues with President Barack Obama's Race to the Top, a federal grant competition that pushes schools to use standardized test scores to retain and reward teachers. The union says many other factors, including a student's health, family situation and the stresses of poverty, make test scores less relevant. Chicago Mayor Rahm Emanuel, following the lead of the Obama administration, wants to make test scores represent as much as 40 percent of evaluations. State lawmakers in 2010 unanimously approved a change in the Illinois teacher evaluation law in order to qualify for millions in federal funding through Race to the Top, creating a culture where teachers are held accountable for their results. What does this all mean for education reform? On one side, educators want the school district to stand up for the teachers who are often unappreciated for their hard work and work in tough environments with less parental involvement and fewer resources. On the other side, outsiders believe teachers in Chicago aren't protecting the children while they walk the streets with picket signs while their students are locked out of the classroom. Is it more than just pay and benefits and needs for the classrooms? What do you think?